This is one of a set. 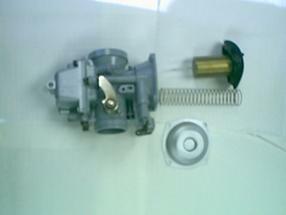 This carb has been setup for a single intake system, that is why some parts are missing or removed. The ones that are missing are for the Sync system and for this example are not needed. 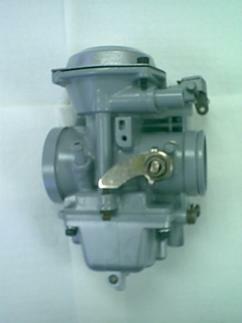 This is a standard 1981-1983 (and may be seen on 84) Hitachi carburetor. All parts are stock unless otherwise noted. These procedures are for the 81-83 but all CV carburators run on the same principle and have similar parts. Most of this info can be used on any CV carb. 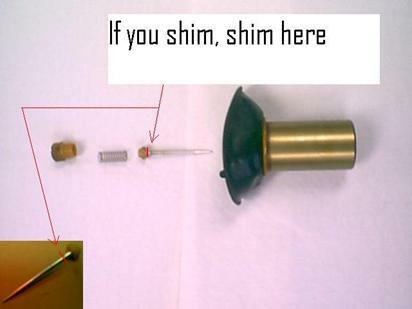 If you are shimming for free flowing air cleaner or opened up exhaust, then the shim goes on the needle, between the needle and the slide. Do not go over 1/8 in thickness (and that’s pushing it). If you go higher then you run the risk of the slide sticking wide open. Two #4 flat washers, are all you will need and most of the time one will due.